This was a super quick prequel novella (62 pages! ), but a worthy one. 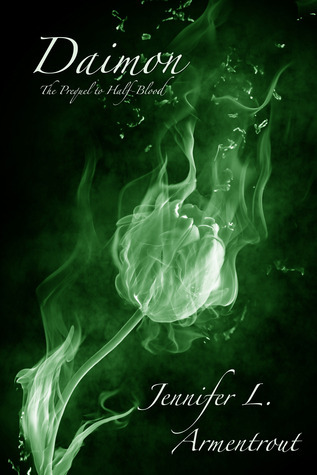 **Before I continue with the review, I'd like to note that you should read this prequel AFTER you read Half-Blood otherwise you will be submerged into a world you don't fully understand yet. It'll make more sense if you read this after and you will be able to appreciate it more. Daimon is a short telling of what life was like for Alex after she escaped the Covenant with her mom and I really enjoyed it for that purpose. Sure we knew from Half-Blood that Alex and her mom had to move around a lot to keep the Covenant from following them; we knew that Alex found her mom killed by a daimon; we knew that Alex had to fight and kill a daimon. But we didn't really KNOW what that was like. We could guess and imagine and sympathize with Alex, but that's about it. This prequel novella paints the picture of what it was like for Alex. We learn how she has to deal with moving around a lot, how she found her mom, and what the aftermath was like for her. That probably shocked me the most just because it really dawned on me: Alex found her mother dead in their house. The only person she had left... she found cold and dead on the floor. I never thought much about how she would have handled and mourned her mother's death, but Daimon shows exactly how that happened. Daimon goes right up to the beginning of Half-Blood so it's like a pre-extension of Half-Blood and I liked that aspect too. After reading it, I felt like I knew and understood Alex more because of the greater insight this prequel novella provided. Apart from the Covenant series, Jennifer L. Armentrout has another series called the Lux series, a couple stand-alone novels, and she recently began writing new adult novels under the name J. Lynn. 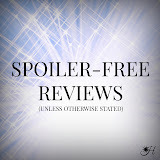 I've already reviewed Obsidian (Lux #1) and Half-Blood (Covenant #1) if you'd like to see if they sound like something you'd read. Find out more about Armentrout and her books on her website, Facebook, Twitter, and Goodreads! P.S. Did you see how I made this review shorter than my typical? I have another short review coming...It's like 3 paragraphs long haha!